Just a quick post tonight. 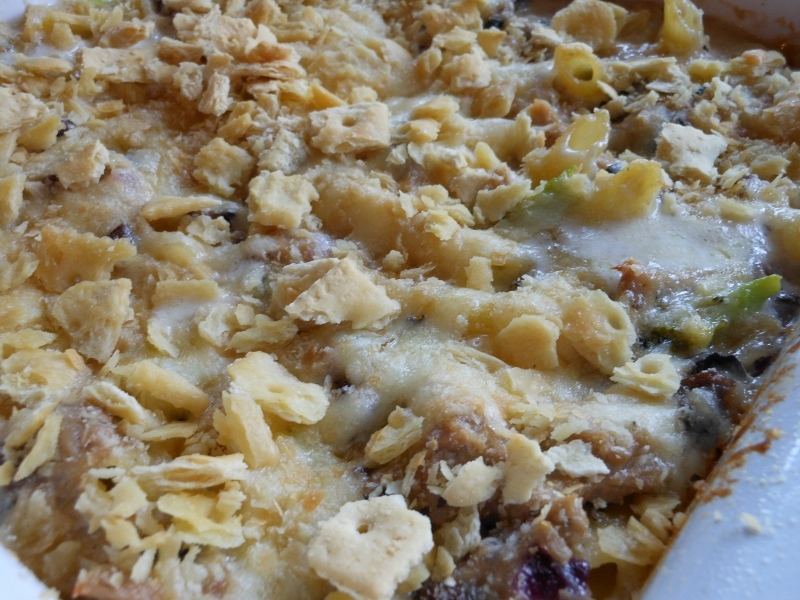 I made an easy chicken and noodle casserole for Charles’ dinner before I left for work so this is a nice make ahead recipe. Substitute the veggies with what you have on hand. 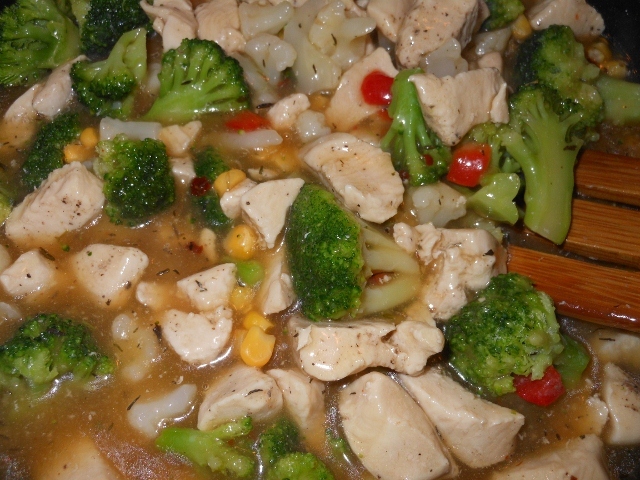 My choice today was a frozen mexican vegetable blend; broccoli, cauliflower, corn, and red peppers but a nice mixed vegetable or california blend will work well too. 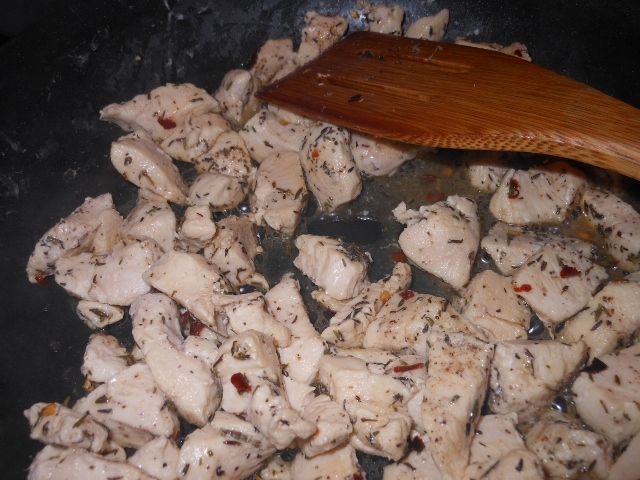 Dice chicken breast and season with salt and pepper; at a little crushed red pepper if you like a bit of heat. Heat non-stick skillet over medium high and add seasoned chicken. Sprinkle with thyme and cook for about 6 – 7 minutes until cooked through. Add chicken stock and bring to simmer. Combine corn starch and cold water. Stir into simmering broth until thickened. 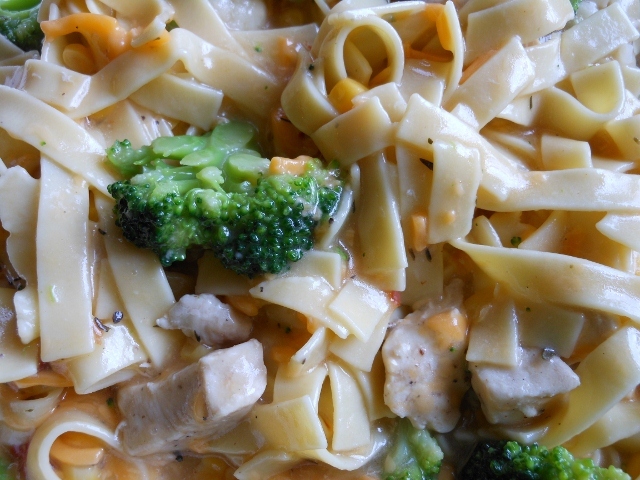 Add veggies, cooked and drained noodles, and cheddar cheese. 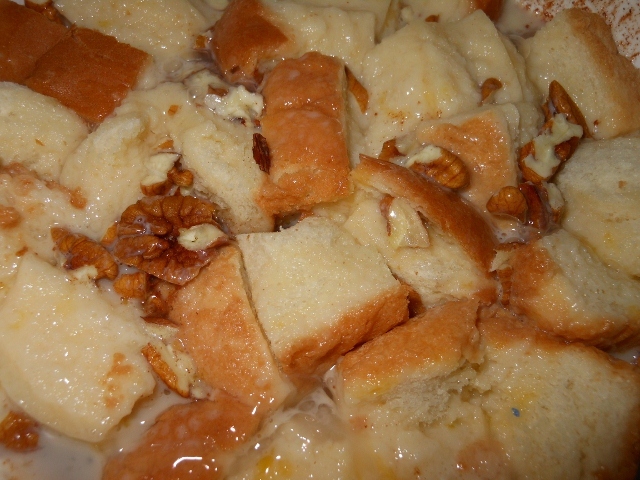 Stir well and pour into buttered 2 quart casserole. 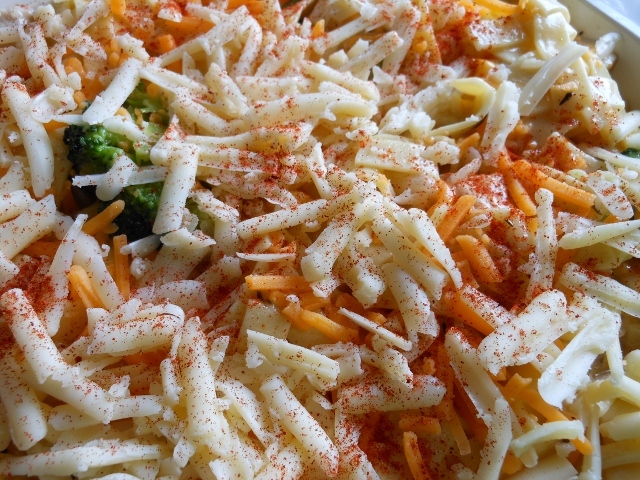 If desired top with additional cheese and sprinkle with paprika. Refrigerate if making ahead. Bake cold casserole for about an hour at 350 degrees. 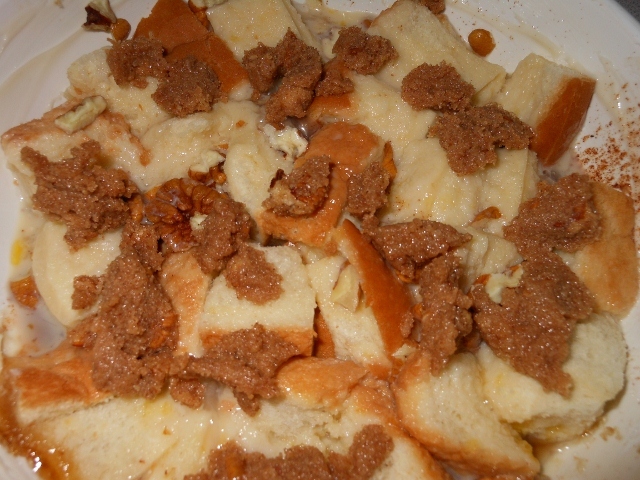 If baking directly after making reduce cooking time to 35 – 45 minutes. Stuffed Mushrooms meets Green Bean Casserole ~ Possibly my newest favorite side dish! 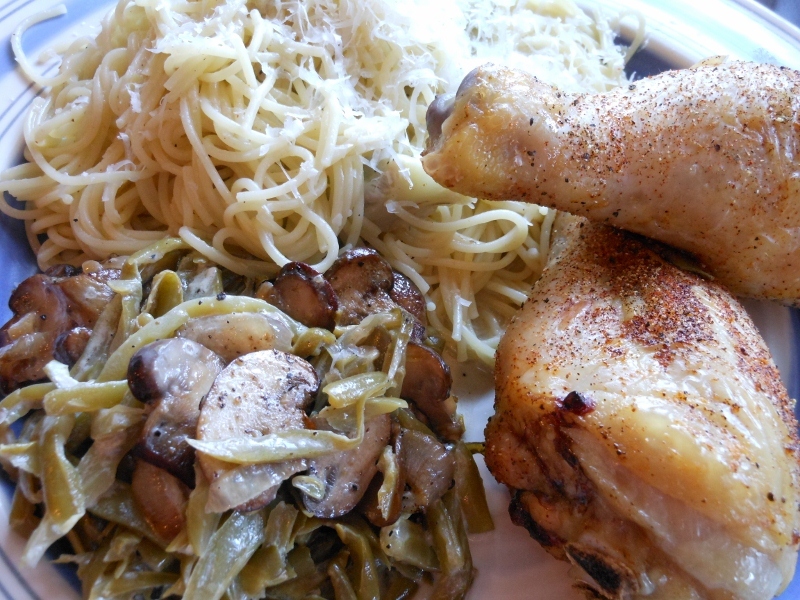 I couldn’t decide what to fix for a side dish tonight when the craving for green beans and mushrooms hit. I was planning on stuffing my mushrooms but the green beans inspired me to try something new. 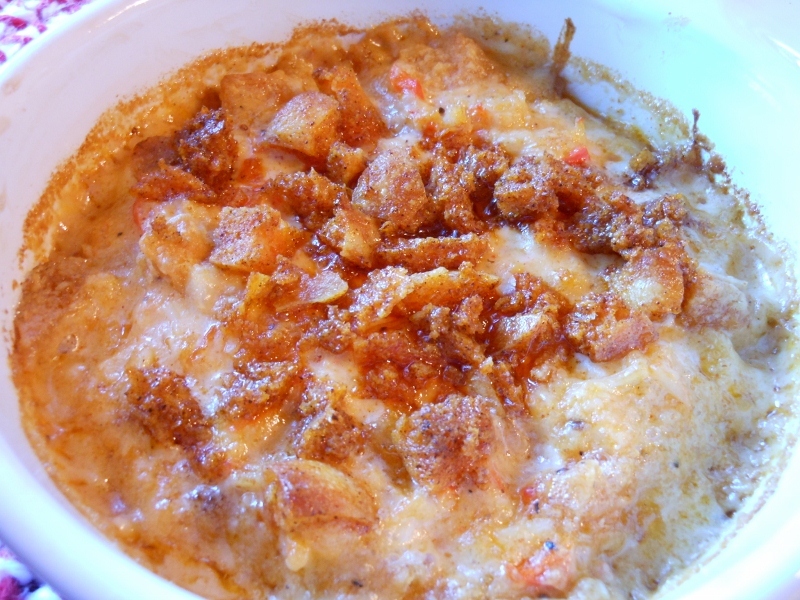 I loved this casserole. It seemed to encompass all of the great qualities of a good green bean casserole and the savory deliciousness of stuffed mushrooms. I will have to make this again; personally I don’t think there is a thing I would change about it. I’m glad there is a little left for tomorrow! 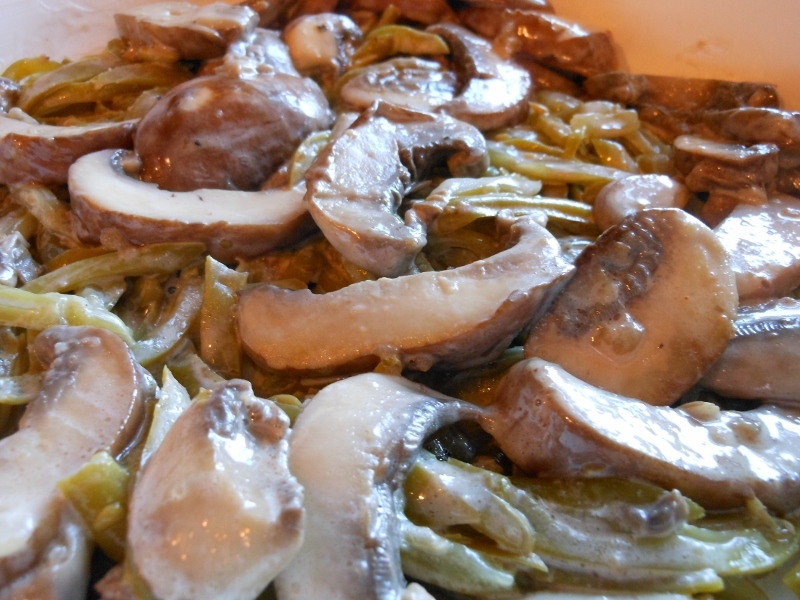 Slice mushrooms; set aside stems and sauté mushroom slices in butter for about 5 minutes. 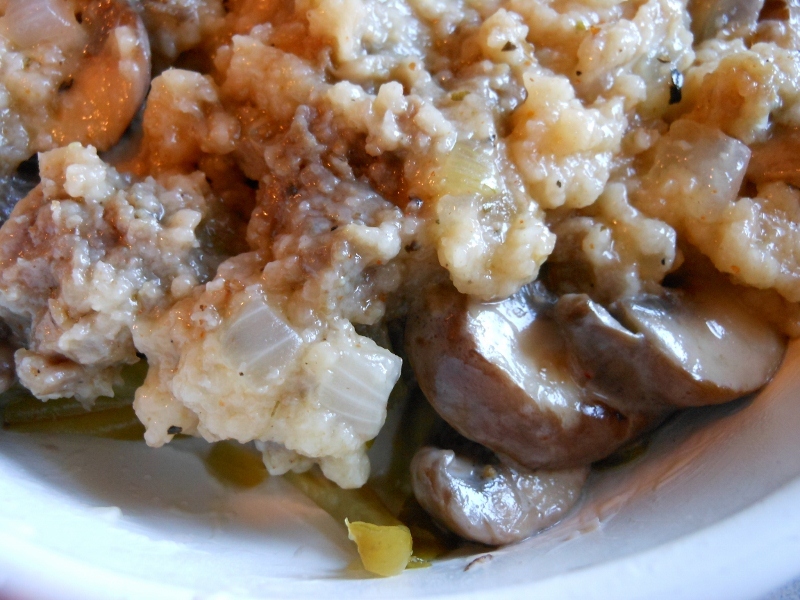 Add cream and pour sautéed mushrooms into bowl and in same skillet sauté sausage, mushroom stems (diced), and onion. Add salt, pepper, cayenne, garlic, and marjoram. 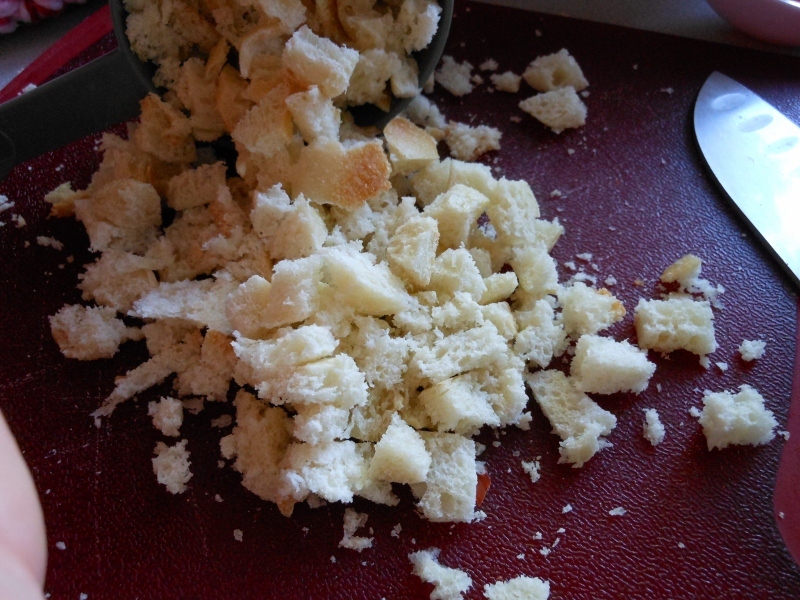 Once sausage is cooked through add chicken stock and bread cubes. 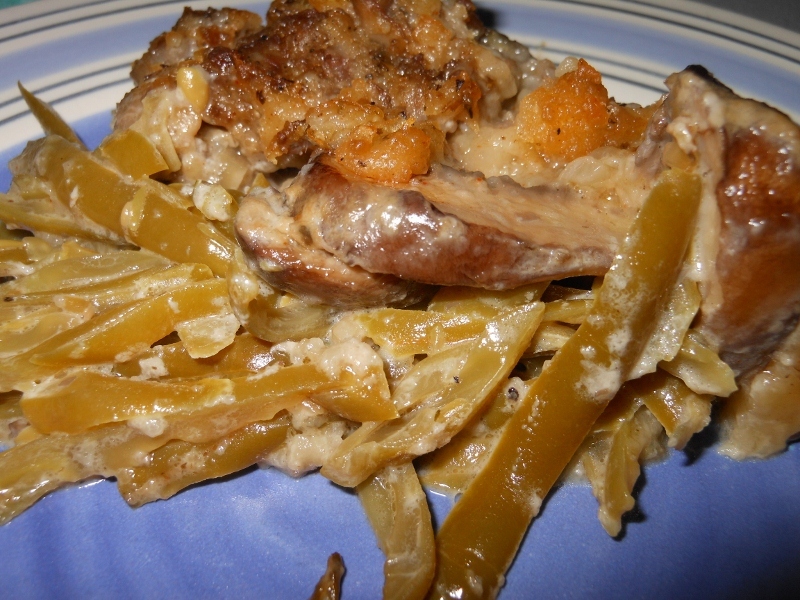 Butter medium casserole and pour drained green beans into casserole dish. 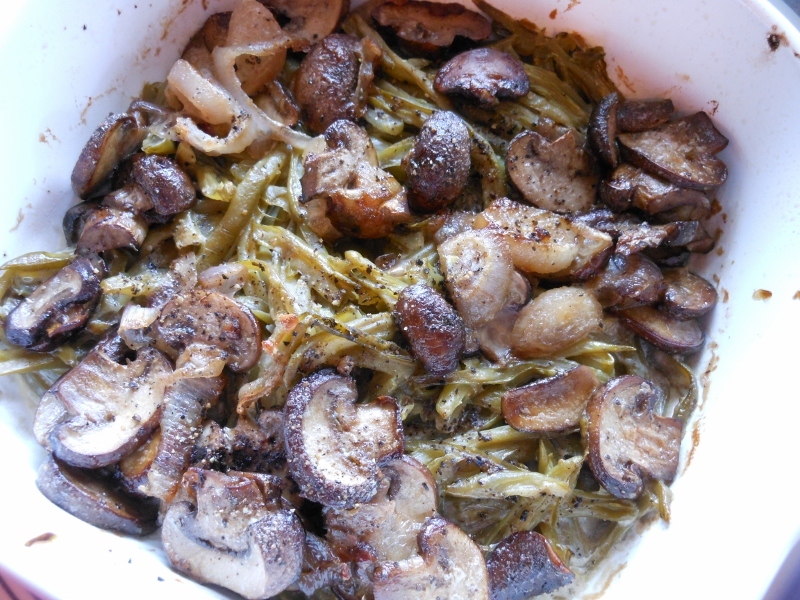 Pour mushroom and cream mixture over top of green beans. 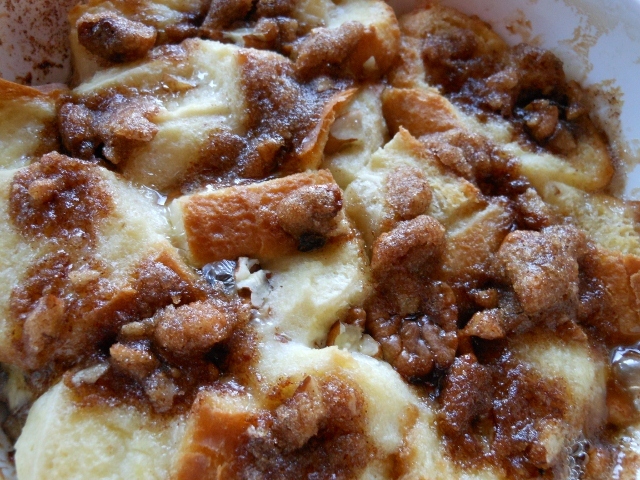 Bake at 350 degrees for 35 – 40 minutes. I was flipping through a Saveur issue when I came across a crab imperial dish. I tweaked the recipe a bit to suit our tastes. I think this came out deliciously. Melt butter in small sauce pan; add flour and stir together over medium heat for about 2 minutes. Pour in cream and cook until thickened. Add garlic, paprika, crushed mustard seed, salt, pepper, and cayenne. 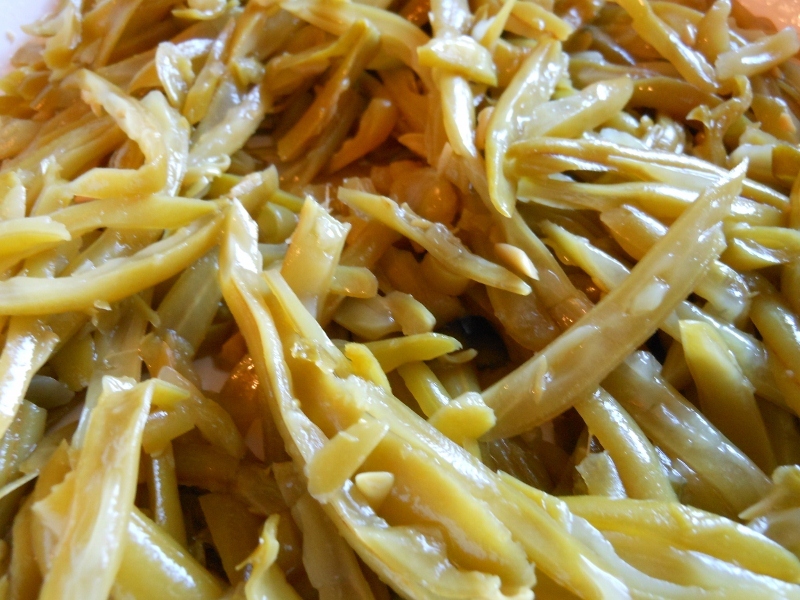 Stir in lemon juice, sherry, and Worcestershire. 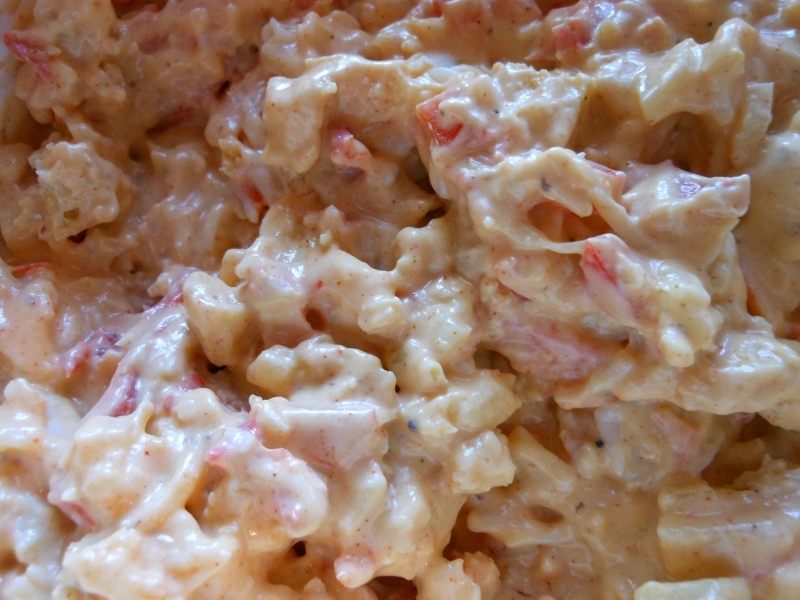 Add crab, red pepper, onions and bread crumbs. 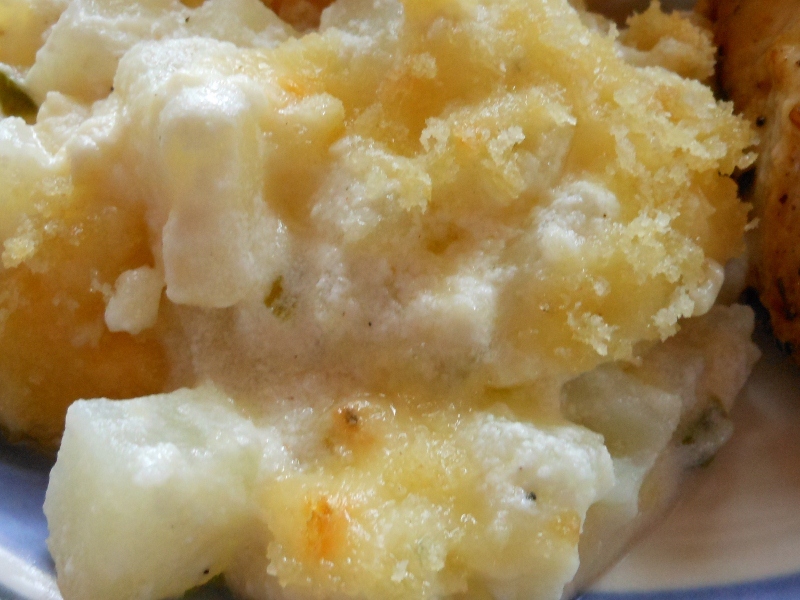 Stir well and pour into buttered casserole or 4 individual dishes. 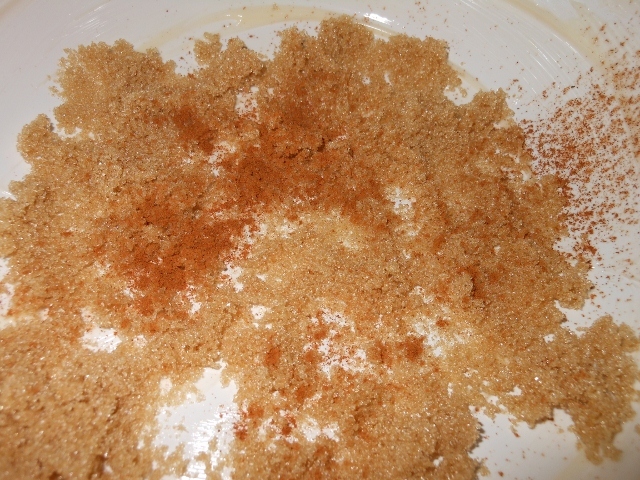 Mix topping butter, bread crumbs, and paprika. Sprinkle over top and bake at 400 degrees for about 20 minutes. 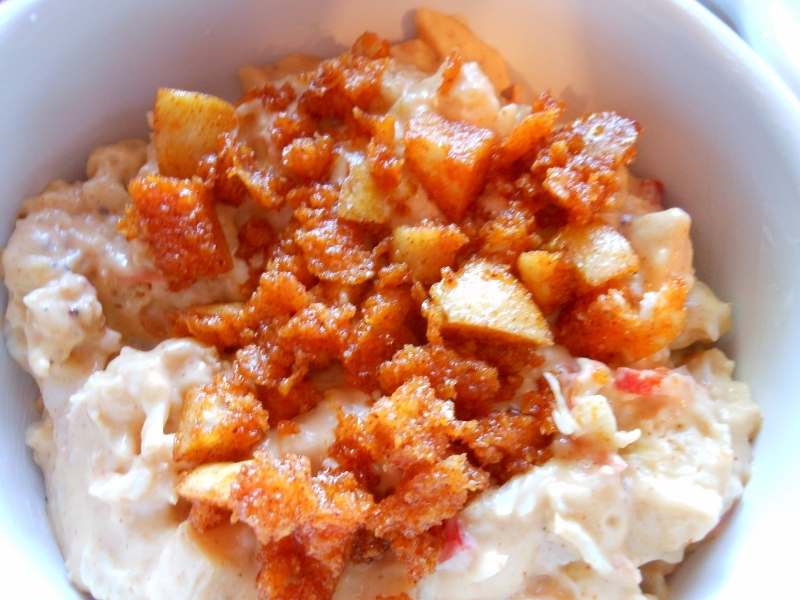 Tuna casserole is one of those easy and versatile recipes to throw together. 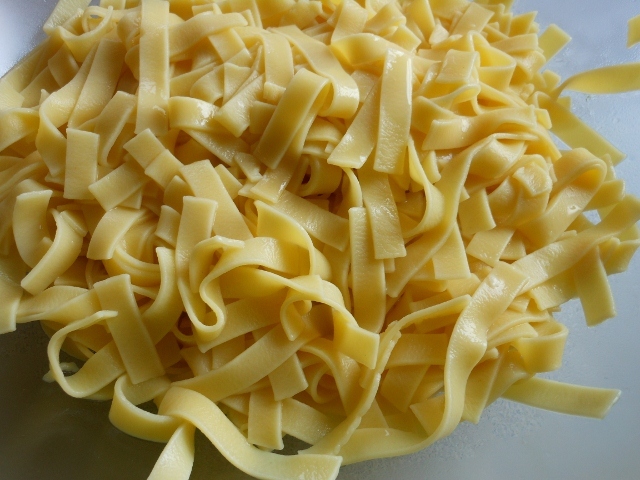 I usually use what I have on hand; sometimes I opt for noodles other times a macaroni type pasta. The vegetables can vary too ~ peas are one of my favorite additions! 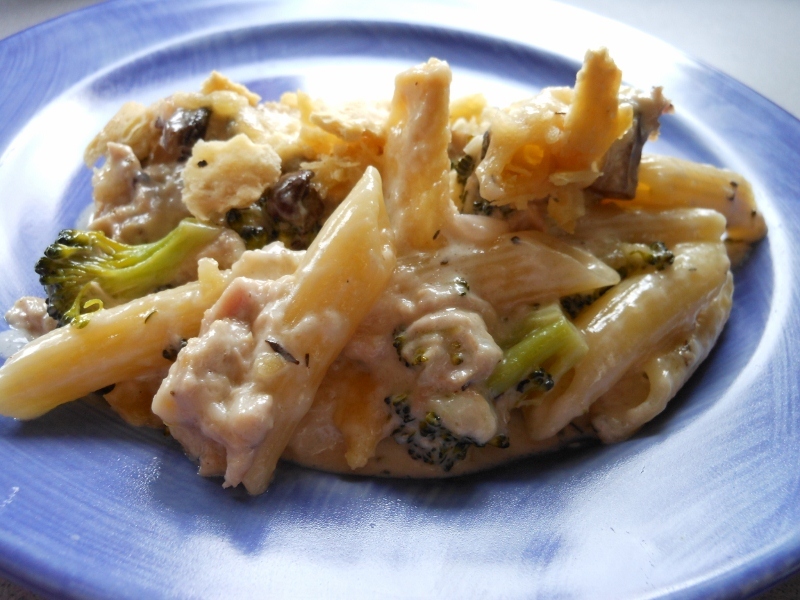 It can be cheesy or just a creamy sauce if desired adjust to your tastes! Sauté mushrooms, onion, and garlic in butter until desired tenderness. Add cream; heat through. Slowly stir in cheese 1/2 cup at a time. Add seasonings and stir in tuna. Pour over pasta and broccoli. 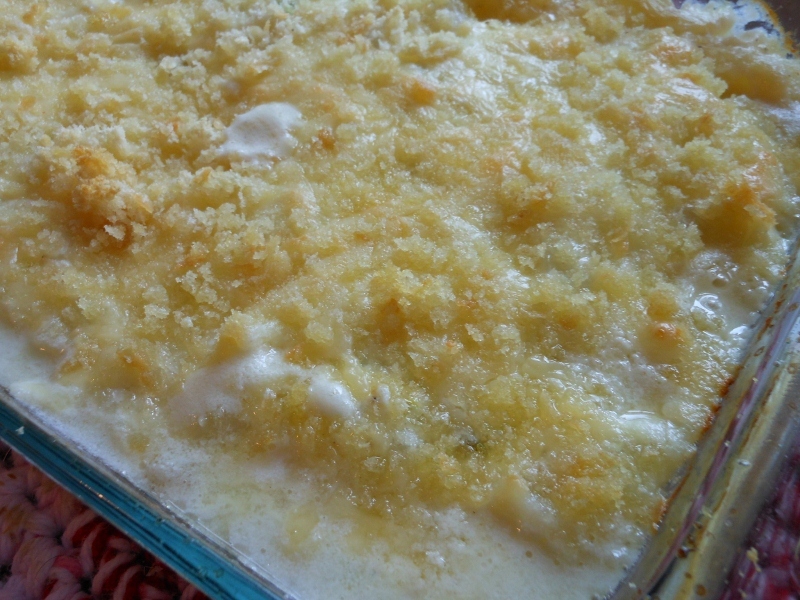 Top with extra cheese and some crushed cracker or bread crumbs if desired. 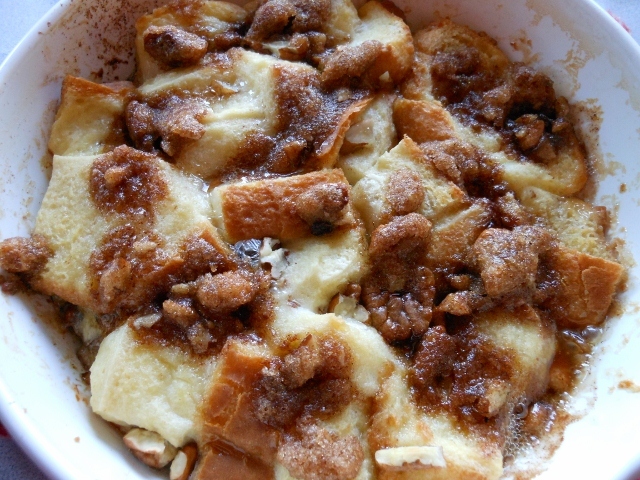 Bake about 20 minutes at 350 degrees or until hot and bubbly. I had a craving for a green bean casserole of sorts. 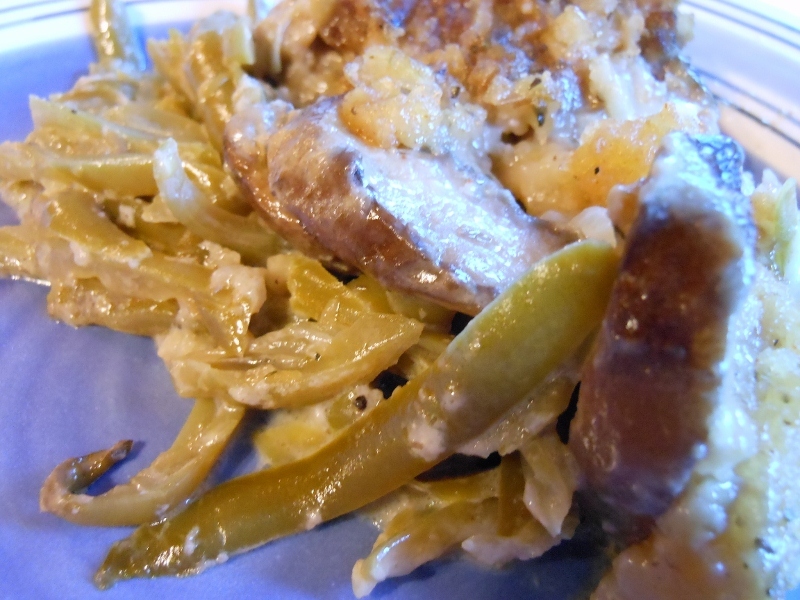 This side dish really hit the spot and was a nice change from the traditional green bean casserole. It was simple to throw together and full of flavor. Slice mushrooms and shallots; over medium heat melt butter and sauté mushroom and shallot about 5 minutes or until tender; season with salt and pepper add cream. 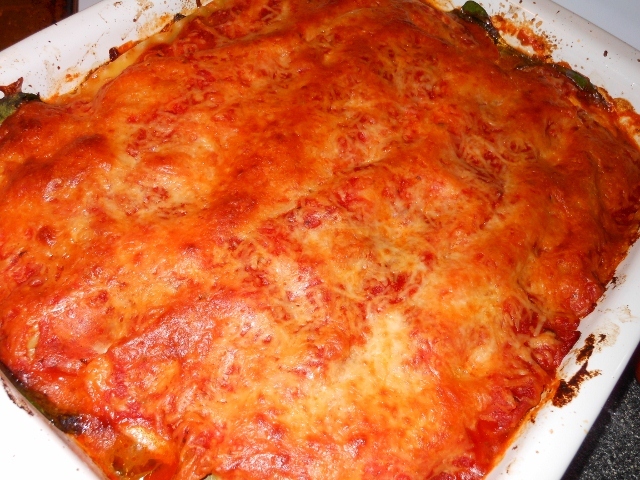 Drain green beans and pour into greased casserole; pour mushroom and cream mixture over beans; bake at 375 degrees for 20 minutes.